Info "Rub the rainbow to fill the happy, dancing bucket with rainbow juice. Ugh, I can't believe I just said that..."
Rainbow Juice is the boss microgame found in the Dance Club Rub stage in WarioWare: Touched! 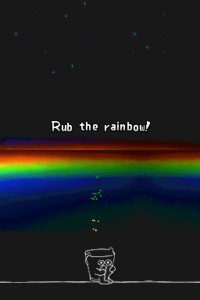 The objective of the game is to use the stylus to rub the rainbow to let the droplets fall in to the bucket. As it begins to fill, the bucket gets up and start to move around. Any missed droplets stack up, and they can eventually get tall enough to tip over the bucket. If that happens, the player fails the microgame. At the same time, if the player takes too long to fill up the bucket, the screen eventually turns very dark, which also fails the microgame. The player wins by filling up the bucket with enough droplets. 1st level difficulty: The droplets fall very fast. 2nd level difficulty: The droplets fall slightly slower, and the bucket has a cover that can cover droplets. 3rd level difficulty: The droplets fall slowly, and the bucket has a cover that can cover droplets, just like in level 2. This page was last edited on October 16, 2018, at 23:00.